Line a 8x12 baking dish with parchment and spray with cooking spray and set aside. Also spray a baking sheet with cooking spray and set aside. Rice the cauliflower (chop in a food processor until roughly the size of rice) and microwave covered 5-6 minutes. DO NOT ADD WATER. 1. Heat the garlic in the oil until fragrant. Add to the cauliflower along with the egg and 3/4 cup of the cheese. 2. In a separate bowl, mix the seasonings. Add to the cauliflower, reserving 1/4 tsp; mix well. 3. Press evenly into the prepared baking dish with parchment. 5. Gently flip onto the baking sheet, removing the parchment. Sprinkle remaining cheese and seasonings. 6. Broil until golden, about 3 minutes. 7. Let cool slightly and then cut, one slice lengthwise and 5 slices width wise, so you have 12 slices. Serve with marinara if desired. 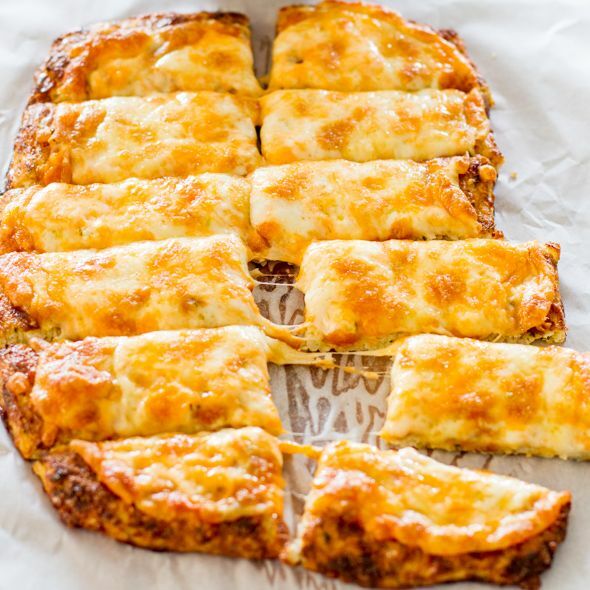 While the minimal cheese in this recipe should not be a problem for Diabetic patients, if you are a Chronic Kidney Disease patient and the amount of cheese in this dish does not meet your Renal diet restrictions, try using alternatives such as Parmesan Cheese which has less potassium or skip the cheese entirely.